Ahtletes know the brilliance of design, the way architects do, the way doctors must. There is an exactness a regiment that if followed offers known results. It does not take discipline to design something brilliant. Discipline is needed in carrying out that design. Were the workers on the dam disciplined? If they weren't in the beginning they learned. Their so-called discipline was mostly fueled by the opportunity to earn money. Money not made, but earned. Discipline as a result of this brilliance of design offered young men an opportunity to be a part of something bigger than imagined. A dam that shot up into the sky 735 feet, was a feat uncontested at the time. A brilliant design that would only come to life by hard work. Hard work was not known by taking days off as much as it was by working in shifts. There were 3 shifts for every 24 hours a day, and working "around the clock" the dam was built in record time. Thus, part of the brilliance of the design is timing. The dam designers may not have considered the workers who ultimately put their lives on the line. Yet they must have known the discipline needed to carry out the design. Not only was the dam built with amazing speed as men acquired this discipline, the dam remains today as a design of brilliance. The Hoover Dam in all ways appears permanent. When it was just beginning to be built, the idea of doing just this, building something that would last "forever" was exciting. Much like the pyramids in Egypt that still stand today, the Hoover Dam exacts that much attention. It is an odd power to be part of something that will seemingly outlast many lifespans. Envision now what the dam might look like thousands of years from now. Will it appear the same? Will it still be responsible for redirecting the Colorado River? 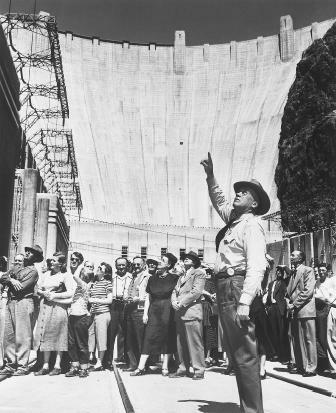 Another way to see the future of the Hoover Dam is through viewing the past lives of the men who built it. Could they possibly know that the dam they were erecting might someday be unnecessary? Who would have bet on that? And yes, the men building the dam were often gamblers, taking whole paychecks to a tent-casino and blowing it all in one night. But would they have bet on this fallacy of permanence? The Hoover Dam operates at full capacity today. As much as we know of the past, we also know of the future. We do things and will continue to do things that hold promise. It's the promises we believe in. It's the promises we work toward. It's the promises that keep standing long after we are gone.